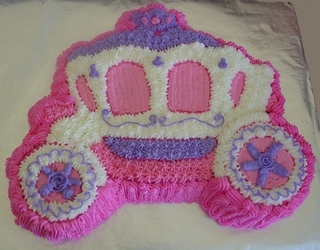 One easy princess cake that is sure to delight party guests is a carriage cake. Using the star-shaped tip makes decorating this cake easy. However, you have the opportunity to add variety and texture to the cake with different decorating tips. To make the carriage princess cake, follow these simple instructions. Decorating ideas and instructions often come with the cake pan, so look for them. Generously grease the carriage princess cake pan with Wilton Cake Release. Do not skimp on this step or your cake may not come out of the pan in one piece. When the cake has finished baking, cool in pan on a wire rack for 10 minutes. Next, place wire cooling rack on the top of the cake and turn the rack and pan over so the cake falls out of the pan onto the rack. Let the carriage cake cool completely. After the cake is cool, place a cutting board on top of the cake and turn the board and the cake over so the carriage cake grooves are face down. Place the cutting board on the turntable. With a sharp knife cut the “belly” of the cake off. This will allow the cake to lie flat on the cake board. Immediately turn the cake back over. Prepare the cake board. Cut the board to the desired shape and size. If you cut the board, trace the cake pan on the board, leaving 2 inches around the edge. Cut board with an exacto knife. Cover the board in foil wrap. Measure the foil wrap leaving an inch all around and fold over the edge. Mix the buttercream frosting and tint the frosting the colors you have decided. The project goes much faster when all the frosting has been colored before you start decorating. When the glaze on the cake is dry, place the cake on the cake board. You may put a little frosting on the bottom of the cake to secure it in place. This is an optional. The cake is unlikely to move if the cake board remains level. Using tip #3, begin outlining the carriage, windows, trim and inside wheels. After outlining the windows and inside wheels, make rows of lines to fill the shape. Leave as it is for a more textured look, or for a smooth finish, pat down with a finger dipped in cornstarch. Using tip #16, fill in the carriage with stars. Follow the pattern or use your own colors. Make the wheel spokes with tip #5. Next, use tip #3 to make the wheel centers, and the swirls and scallops on the carriage. Add dots, shapes or words onto the princess cake to personalize it to the birthday girl. Finally, using tip #21, make scallops on the sides of the cake to finish it all off. Congratulations on a wonderful carriage princess cake. This is an easy birthday cake to decorate, but you can be creative and add additional decorations to add texture and dimension. Find the perfect cake topper for your princess cake. Click on the images below for more information or to order.